Hackney Community Transport, trading as CT Plus, took over route W13 from Arriva on 10th March 2007, initially using ex-Centra Darts hired from Dawson Rentals and spares from their existing fleet; as seems fairly usual nowadays the new buses were delivered late, but started entering service in mid-June. The allocation comprises five Enviro 200Dart/East Lancs Esteem to cover most of the service, and DE1 (PN07 KPY) was photographed in the eastern arm of George Lane, South Woodford, on the (very wet!) afternoon of Monday 23 June 2007. 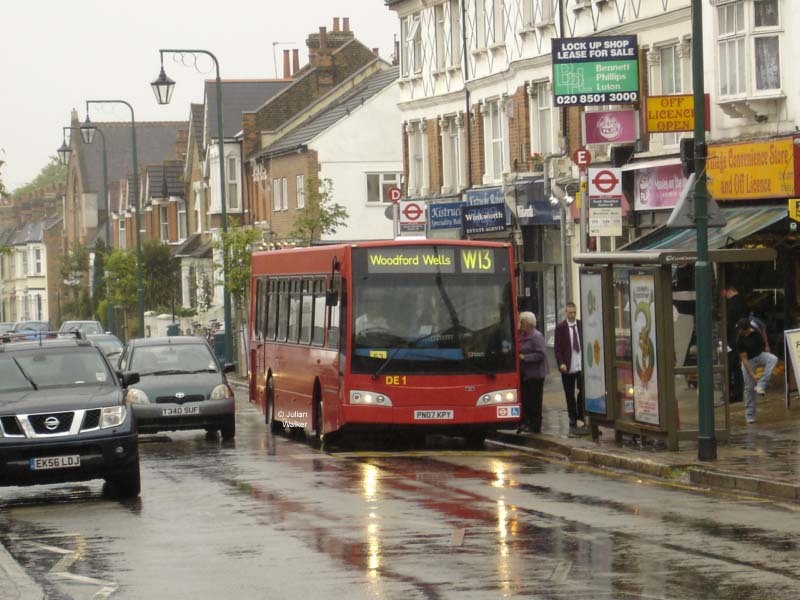 Due to demand for travel to schools in the Woodford area the W13 has for many years had a double deck working, until now run on a separate contract to the main service. These have been incorporated into the main contract, and the bus now works through the afternoon peak alongside the single deckers. The photo shows HTL8 (LR52 LWH), one of the batch of 13 Trident/East Lancs ordered for route 388, one of the new routes introduced in 2003 to provide additional bus capacity ahead of the introduction of Congestion Charging. The bus is descending the flyover which was built to take George Lane over the railway before it became part of the Central Line; it replaced a level crossing adjacent to South Woodford Station. CT Plus has ordered a Trident with the new East Lancs Olympus body, nominally for these workings; however when this arrives (due around the time of writing) it will probably appear mainly on the 388 with the schoolday journeys on the W13 continuing to use the 2003 Tridents. The W13 was created in March 1989 by splitting route 235 at Leytonstone – the Leytonstone to Chingford Mount section became route W16, and there was no overlap. The 235 was latterly operated from Leyton garage with Leyland Nationals and had to evening or Sunday morning service, but the W13 provided a full daily service. The new route was tendered and awarded to Eastern National, who used Mercedes 811D minibuses. The above mentioned school journeys were not renumbered with the other changes however, perhaps because at that time it was felt that letter prefixes should only be used with minibuses. The residual 235 service was also awarded to Eastern National using VRs. There have been no major changes since then, other than several changes of operator, although the late evening service was withdrawn again fairly soon. Eastern National was split in two on 29 July 1990 and the south Essex and London operations transferred to the new Thamesway company, although with no major changes operationally. The 235, which was a separate contract, was transferred to Grey Green in 1992, and was renumbered to W13 in 1996 freeing the number for use elsewhere. After the sale of Capital Citybus to FirstGroup in 1998, the London operations of Thamesway (already owned by First) were amalgamated with CCB. The building of the controversial A12 relief road through Wanstead and Leytonstone caused considerable disruption for several years. The old A12, Cambridge Park, was closed off westbound at the Green Man roundabout, causing the W13 and other routes to be diverted via Lonsdale Road, a residential street. This was initially deemed unsuitable for double deckers, so the W13 school journeys took an alternative routeing via Blake Hall Road and Bush Road (also used by routes 66, 145 and N8). 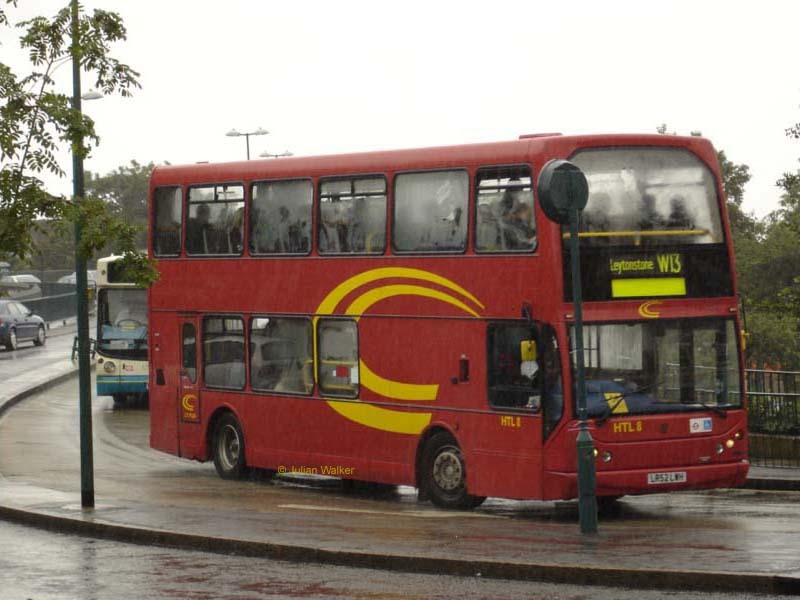 Upon re-tendering in 2000 the W13 was awarded to the former County Bus operation, now part of the Arriva empire along with Grey Green (who already ran the school journeys). A full evening service was restored at last. This was a 7 year contract, eventually bringing it into line with the school journeys (which had been re-tendered independently in 1997 and 2002) to expire in March 2007. As had happened with Thamesway, the London operations of County Bus were eventually amalgamated into Arriva's main London operation. Then as mentioned above the whole W13 was lost to HCT from 10 March 2007. The school journeys adopted the standard routeing at the same time.